make it perfect: .little spout. Is this the cutest thing ever or what?! 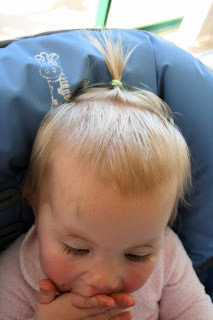 Lil's first little ponytail. The mullet look is getting out of control and I was really surprised to find that she had enough hair on top to make something out of! I used some of Heather Bailey's Trash Ties to put up the do and didn't think they would hold it in place, but they are actually really good. When I figure out how to do some creations in my hair I will share, but you might be waiting awhile given my track record with creative hair styling!! 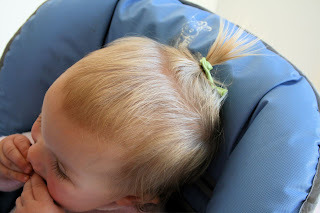 my little girl didn't have hair for such a long time and I was overjoyed when I did her first ponytail too!!!! 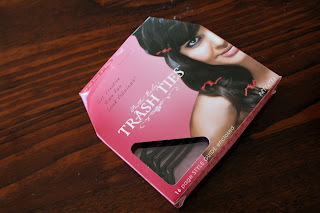 I was looking at the trash ties a while ago, did you get them in AU? Such a cute little spout! 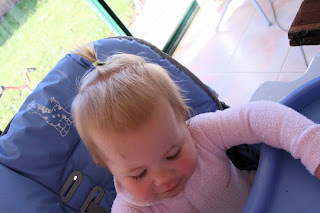 First piggy tails are very exciting!!! Very cute!